I got two big projects that have been hanging over my head accomplished yesterday and, boy howdy, did that feel good. 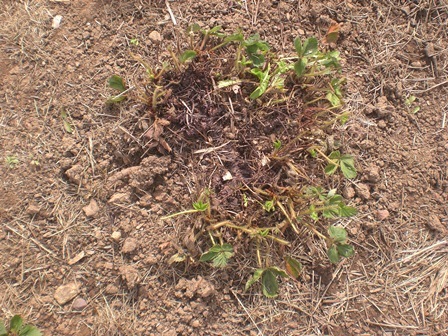 The dandelions that had been growing profusely in and among my strawberry plants were eradicated. Thanks to both Papa Pea and SmartAlex (two great minds who both suggested I use my asparagus knife to cut the dandelion roots way down deep), I removed all the offensive dandelion plants and any extra weeds I came across. 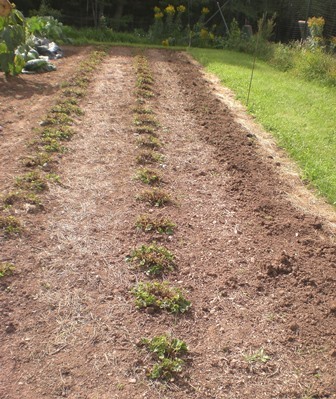 I also popped out (using my trusty spading fork and a bit of grunting and groaning) the whole row (on the far right) of Earliglow strawberries that have never produced well for me. For next spring, I'll order more Cavendish plants (my best producer) to plant in this row. I'm thinking I should order extra, too, in case I have to replace any of the dandelion-ravished plants that don't make it over winter in the other two rows. 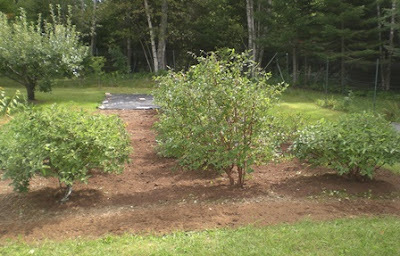 Next on the agenda was to work in the blueberry and haskap berry patch. The haskap bushes really showed a lot of growth this past season and their bottom branches drooped all the way to the ground which made it hard to harvest the berries and impossible to get under the bushes to fertilize. I took my pruners and went to work erring on the "not enough" side rather than shocking the bushes too much. The tall one in the middle is a different variety than the two on either side. With haskaps you need this other variety as a pollinator. 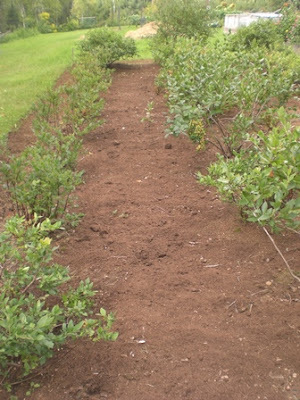 A quick weeding of the blueberry patch and I was ready to spread more peat moss which I never finished doing earlier this summer. Actually, I had run out of peat moss. Papa Pea picked up another bale for me (locally and more expensive than in the big city) and lugged it down to the patch a couple of months ago. I was so tired of looking at it that I finally kicked myself into gear and got it spread yesterday. Now, it's done! This picture doesn't show our whole patch of nineteen bushes. The bushes in the row on the left are the ones we planted most recently. Blueberry bushes take forever to gain size (and a full crop of berries) but these are coming along nicely. So good to have the strawberry and blueberry/haskap patches done. And by crikey, I really felt like I had accomplished a lot at the end of the day. Getting things done, which have been "hanging over one's head," is a super accomplishment. Dandelions are still "growing like weeds" here too. I don't think I've seen anything like it. A very healthy year for weeds. Wowzers! I had to laugh that you really felt you had accomplished something. If you are as I am that wasn't all you were feeling. Seems as if each year I find I feel my activities in places I never have before. Good job! You cut your strawberries back? Is this important/helpful? We split about a cord of wood yesterday. Winter is coming. And although we have been having seasonal temperatures, yesterday decided it would turn hot. And then storm. But I am happy to say the wood is nice and dry under its cover. Now only 3 million more logs to go. I hope your strawberries will recover - darn those dandelions! At this rate, you will have the ENTIRE WINTER to enjoy your quilt room! Maybe even most of the autumn! It is such a good feeling to get big jobs done, isn't it? Or so I've heard, not having gotten any big jobs done in forever. Sounds like a very productive week. At least that's behind you. Now on to the 50 million other things that need doing around the homestead. That was a big job to have behind you. Better pat yourself on the back. It looks so wonderfully neat. and a great feeling when you got it done. I hope your strawberries survive. I use to have a strawberry garden and use to have trails every where. Always popping up where they weren't suppose to be. We're suppose to have off and on rain for the rest of the week, but hot and humid. Ugh!! Not much going on here at the moment as Lester's salaried work continues to eat up his time, so only the cutting back of the brambles is being done at the moment and that is by me. Don't like to investigate what is happening out in the veg plots, hoping the eventual frosts will kill off all upstanding weeds. Love to read about how you are getting on though, as it reminds me of why I love this lifestyle, which is something which tends to slip away out of my mind during this time of Lester's employment! Jenn - The only thing that is keeping me going on my garden right down is thinking of how good it will feel to have it ready to put to bed for the winter! Phil - Same here! Even our autumnal colors haven't made an appearance yet. What's going on? tpals - It's the way I've always done it for years. 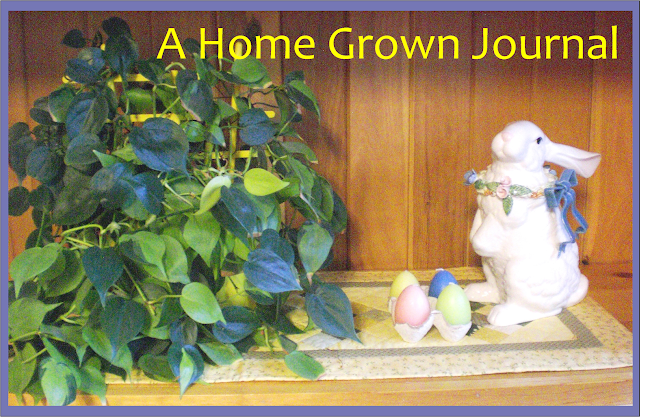 After the crew cut, the plants spring back with new growth and that way after I uncover them (take the heavy layer of mulch off) in the spring, I don't have to deal with the yucky, wet, half-moldy glop of the big mass of old leaves on each plant. It does seem to rejuvenate them, I've found. MrsDM - When one heats with wood, it seems the wood work is never done! But such a good feeling having as much as possible cut, split and under cover. Better than money in the bank in that it's right on your property and immediately ready to keep you warm! Susan - You can't fool us, little lady! You get PLENTY done in a small amount of time! J. L. Murphy - Isn't that the truth! Sometimes it's hard to appreciate and feel good about a job done because of all those others still "on the list!" Gotta get a better attitude about that, I do! Lynne - Thanks for the good wishes for my strawberries! Hope your weather turns more autumnal soon! We're enjoying temperatures that are staying well below the 80s . . . finally! Vera - As much as we would like it to be different, we simply can't do everything. Or even hardly two things at once. Lester putting his time in on bringing in the cash is what is important right now. And you need this time to rejuvenate in order to be in tip-top condition for next year!! Hugs. wisps of words - Even though we're not seeing much fall coloring around here yet, I figured it was time! Our color season seems very late this year. What's going on?